The Briarwood bookcase bed is the perfect solution for those of you who need someplace to put their “stuff” but don’t have room for or want nightstands. Shown here in solid oak, it features a large central area and two side areas. The sliding doors can cover the side areas or slide together and cover the center, plus you still have the whole top surface. You will really appreciate the sturdy Amish quality of the Briarwood heirloom beds as well. 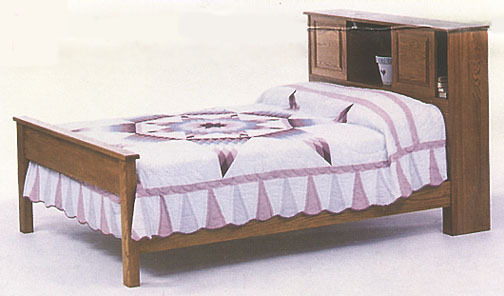 Ask us about having the Amish make your bed out of Cherry, Maple, Quartersawn Oak, Hickory or Walnut. Or just get the headboard!